Workplace environments are changing rapidly in the digital era. Gone are the days of anonymous cubicles and rigid environments. Today’s employees want a workplace that supports their creativity, collaboration, and wellbeing. Just as the strict boundaries between work life and home life are increasingly fluid, so too are the physical spaces we work in. Forward-thinking office design ensures physical spaces that both reflect, and reinforce, a company’s culture, mission, and values. “Resimercial,” the term for the blend of commercial and residential furnishings, is a contemporary approach to workplace environments that provides employees with flexible and comfortable spaces. Here are three spaces that today’s workplaces need. A lot of work today in the workplace is collaborative and creative. So workspaces need to be flexible to meet a wide range of needs from large meetings to small brainstorm sessions. To accommodate this need, consider comfortable furniture such as couches and modular sectionals that can be easily moved. In addition to large conference tables for meetings, consider small tables where teams can work together on projects. Design company Steelcase calls such office spaces “the resilient workplace” for how they support employee wellbeing by offering a range of options for both individuals and groups. Collaboration is a crucial aspect of today’s work world, but employees also need space for cultivating focus, interiority, and silence. Creating intentional quiet spaces that offer privacy are just as necessary as flexible multipurpose spaces that foster greater interaction and connection. In fact, to demonstrate their support of employee wellbeing—and help boost productivity—many companies are now dedicating spaces for meditation, yoga, and even power naps. Employees need spaces that support their work habits, as well as their physical needs. Today women make up almost 50% of the workforce, and with Millennials now the largest generation, that will only continue. Workplaces that reflect the reality of women’s lives provide private and comfortable spaces where breastfeeding mothers can pump breast milk to take home to their babies. 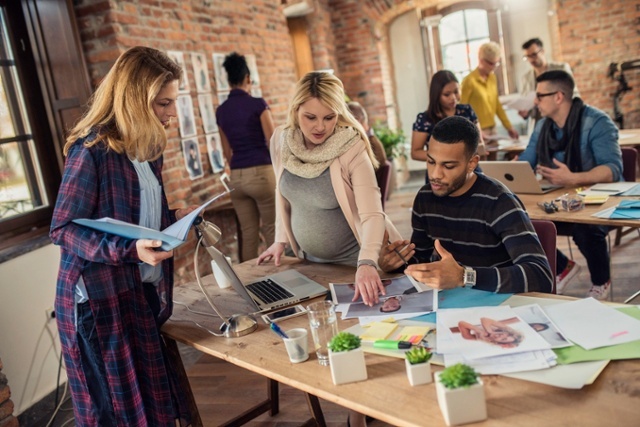 Depending on how many women work in an office environment, workplaces will need to ensure that they have the appropriate number of spaces to meet the need.